We have been working each day to put all the sounds together to read simple words! This time of year is so much fun in kindergarten! The students know many sounds and are starting to blend them together to read unknown words! 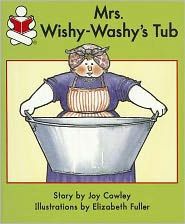 We read Mrs. Wishy-Washy's Tub by Joy Cowley and the students were so surprised that they could stretch the word tub and read it all by themselves! We had a great discussion about the words water and soap and had to use the letters in the story to decide and defend our ideas! This is a great book for kindergarten students to read on their own! If you click on the picture you can find it at Barnes & Noble. How do you read unknown words? First, we say each sound in the word. Then we say it faster to read the word. The students are so proud when they can read words! Check out a short video that explains how to blend the sounds together to find an unknown word!